On Tuesday I had a stressful day. A dip in the highs and lows of life day. It wasn’t surprising. I had some concerning news that took the wind out of my sails, and I developed a pressure cooker of a sinus headache. I was in a trough. I know how my mind and body are connected. My body tells me quite clearly when I have to pay attention to what is happening around me and what I am feeling. The message is clear – take care of my well being. Pause. Connect to my Self. My thinking revealed that Val was not present or in balance. My defensive inner teenager had been unleashed. Everyone was dumb. They didn’t get it. They didn’t see how much pain I was in. They took advantage of me. They tried to control me. All the unmet needs from the past were right there demanding attention. Our inner teenager is challenging and requires some kindness and understanding. Its in pain – emotionally and often physically. It has so many unmet needs and is trying to figure out how to get them met as they move from childhood into independence. It is our ego at the height of all of its immature defensive glory. One part of me was determined to be miserable and show the world (?) that I had every right to be. Thankfully the part of me who has learned to be a compassionate observer knew that it was time to unplug. NOW! You are stressed. Take care of yourself and find your middle ground. Be gentle and kind. Let things be as they are. I began to feel better and went to watch tv to distract myself … and found I had no appetite for it at all. ZERO. I wanted to stay in solitude. I journaled instead. The old habits of distractions, shopping, cleaning, entertainment, drinking and eating had lost their pull in that moment. By being fully present and knowing how to ride the wave and find my middle ground helped me center myself. So I honored the request to be alone and put my teenager to bed early. I woke up as a headache free and stress free adult once more. Ready to approach the day with a sense of curiosity. Thank you to the makers of Sinutab, yoga and meditation, journaling, my husband and friends who support and nourish me, and to those of you who read this today! 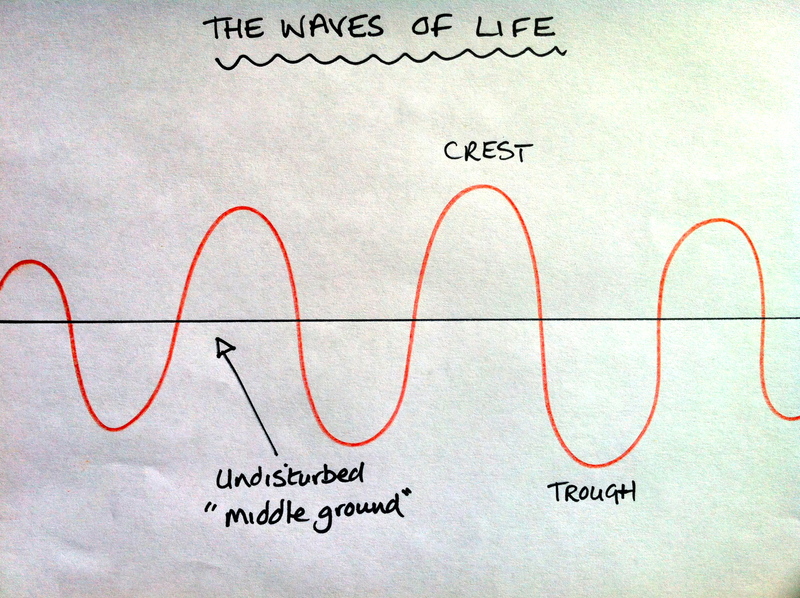 May we all find our middle ground in the waves of life. We ride the waves together Val. 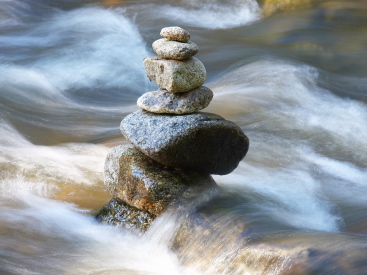 knowing when to stop, you balanced yourself far quicker than ignoring it. Your release sounds very nurturing and you remind us its ok to have teenager or toddler days as well! Thank you Karen for your comment and being here. Ah yes, that irksome inner teenager! Know her well. I love how you describe your process of claiming the middle ground without pushing, pulling, cajoling, it into place. Such grace and ease in your movement. thanks for the reminder to take care of me in all my states of being without judgement. Thank you Irene for your kind words. I appreciate you stopping by. Oh Val, Tuesday was a challenging day for me as well. Seems the Virgo New Moon was working overtime! Such wisdom in what you offer here…finding our quiet space to listen and suspend all of the noise. Beautiful. Tuesday became Wednesday here in California. I was challenged at work by a group of ten teachers wanting a scapegoat. Now, as I share this moment with you, we will put up the sails and skim lightly across the water, allowing our inner children to find peace and joy once again. It’s so familiar and we all have them.Taking time to do all of those things is the best thing we can do. Thank you Joan! Learning to treat the well-being of mind body and spirit is such a gift we can give ourselves. I blame the new moon we had on Tuesday. 😉 I know it sounds silly, but I always feel out of balance when there’s no moon. The saying goes that people get out of whack during a full moon, but it’s the exact opposite for me, I get out of whack during a new moon and always feel amazing during a full moon. Just as with the tides, my mental states exhibit their greatest variance around the times of the new and full moons. In fact, the variance both in my mental states and tidal ranges themselves are at their most pronounced just before and just after the new and full moons. I detect notable shifts in mental states up to 5 days before and 3 days after a full moon, the weakest variance being on the day of the full moon itself – exactly correlating with the high/low tidal range variations. The effects, for myself, are less pronounced at the time of new moons, though are broadly the same. I used to be a werewolf but I’m alright nooooooowwwwwww. . .
Love the humor Hariod!! Its that Harry Enfield got you going! Hariod …. I just read your additional comment. I really will explore if there are any patterns! “The old habits of distractions, shopping, cleaning, entertainment, drinking and eating”… I thought it was only me! It is amazing how they work, but do not WORK. Glad that you returned to your middle ground. When we tune into our inner wisdom, anything that “resonates” can be an arrow pointing us in the right direction. When I’m out of sorts, a good night’s sleep is often the best gift of self-care I can give to myself. Glad you bounced back to your middle ground. What a beautiful post Val, I love how you honored your body, and it is comforting to me as I am learning how. But, I loved your description as you were going through emails – sometimes I react just like that when scrolling through Facebook, and I’m learning that is a sign to step away! Step away and STOP are good messages where we notice this! Thank for for sharing here Kate! You touched my heart Diana. ❤ Thank you for your understanding and support. It means a lot to me. I am so glad to hear that Val. Wish you could see the big ear-to-ear grin your comment has put on my face! I’m picturing it …. beautiful! Thanks for stopping by Jen. Glad it resonated with you. Thank you for stopping by Deepti and the follow. This is a loving and insightful article on Robin Williams. I look forward to connecting more! Wow I loved how well you described how you dealt with this challenge! I look forward to reading more of your blogs!